It’s unfortunate that many teriyaki dishes are made with wheat-containing soy sauce. In this video learn how to make your own, fresh gluten free version of Ginger Teriyaki Salmon. But the adventure doesn’t stop there! Tiffany takes you beyond the kitchen through her unique perspective as she teaches you just how these wonderful fresh ingredients foster wellness through their medicinal properties. Enjoy! I was so bummed when I found out that wheat is in most soy and teriyaki sauces. So I came up with this recipe with some help from my friend Carol. Wow is it tasty! You can even use the same marinade for veggies, tofu, or other meats. • 1/2 teaspoon ground pepper or, if you like a little kick, a teaspoon of gluten free hot sauce. 1. The easiest way to marinade is to put all of the ingredients into a quart sized zip lock bag. Move the contents all around in the baggie to make sure that everything is coated and mixed well. You can also just put all the ingredients in a bowl or baking dish to marinate. Refrigerate for 15 to 30 minutes. 2. Use a medium sized skillet. Coat the skillet with a bit of oil and heat to medium high. When the skillet is nice and hot (1-2 minutes), put the fish (reserve marinade), skin side down. It is fine to have bits of ginger and garlic on the top of the fish. Let the fish sear for 2 minutes and then pour the marinade over the top. Let it cook for 2 more minutes. The sauce should begin to thicken. Turn the fish over and cook for another 3 to 4 minutes depending on the thickness of the filet. If the sauce begins to caramelize, add a bit of water to thin it out. You want a syrupy consistency in the end. To check if the fish is done, stick a fork in the thickest part and open it up to see if the color has changed from bright pink to a lighter shade. Do not over cook because it will lose flavor and become dry. 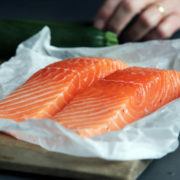 Take the fish off the heat immediately when it is done and transfer it to a plate or serving dish. Cover the top of the fish with the extra sauce and tidbits from the skillet. Yum! • Try this over rice of with a side of steamed veggies. • Another option is to add 1/8 cup of gluten free Dijon mustard to the marinade.